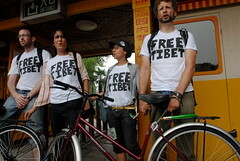 By protesting the video put out by the Tibetan Government-in-Exile that shows Tibetans being beaten and tortured in Tibet last year, and then blocking YouTube to make sure that nobody in China’s borders sees the footage, the Chinese government made international headlines and ensured that millions more people will see and hear about the footage. Wall St Journal: China’s YouTube Block: A Tibet Connection? On February 25th, the first day of the Tibetan New Year, around 100 monks in Mangra (eastern Tibet) held a candlelight vigil and protest march from Lutsang monastery to the local town center. Following this daring protest, the monastery was surrounded by People’s Armed Police and reports now indicate at least 3 of the monks have been detained. 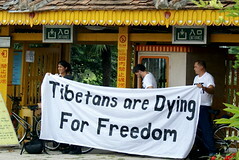 Despite overwhelming repression and a heavy Chinese military presence in Tibet, Tibetans continue to resist Chinese rule. The ‘No Losar’ movement is one of the most creative civil disobedience campaigns ever seen in Tibet. Despite the Chinese authorities’ best attempts to stop them, Tibetans right across the plateau canceled traditional Tibetan New Year celebrations and turned this normally festive time into a somber time of mourning for those killed and imprisoned since last year’s protests. Our Nation: News & Analysis on the State of Tibet. Click here to go to the SFT HQ blog and watch episodes 1-9. Tibetan Flags Protest Beijing 080808 from Students for a Free Tibet on Vimeo. Last night, just before the start of the opening ceremonies, three SFT activists — Jonathan Stribling-Uss, 27, and Kalaya’an Mendoza, 29, Americans, and Cesar Pablo Maxit, 32, an Argentine-American — were immediately and forcibly detained after unfurling Tibetan flags. We’ve just found out that all three were deported from China earlier today and are on a flight back to New York. 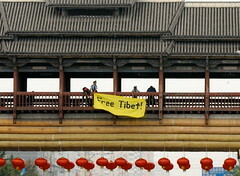 Tibetans have never backed down from their desire for independence in five decades of brutal Chinese occupation. And SFT and our global activists will keep speaking out during these Olympic Games. China thinks they can hold the world’s focus on sport and Beijing’s bright lights, but we’re proving that they can’t keep focus off of Tibet. My interview yesterday on Canadian television, who ran a good story on the Great Wall protest. You are currently browsing the Protest category at Beijing Wide Open.